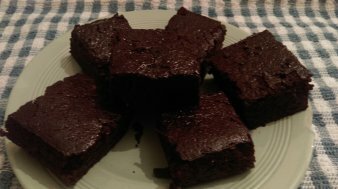 Vegan Brownies – Create, Make & Bake! 8th February 2018 8th February 2018 - by Abbie - 3 Comments. These brownies are perfect for vegetarians and vegans. They taste like what would happen if a cake and a brownie had a baby and fed it nothing but oil, and then sold it to a fudge factory…. true story. Anyway it doesn’t taste as bad as it sounds, it’s actually quite nice, for our first vegan brownie. 1. Mix together the flour, sugar, cocoa powder, baking powder and salt. Pre heat oven to gas mark 4/180°C/350°F. Line a brownie tin with grease-proof paper. 2. Then mix in the water, oil and vanilla. Plop it into the brownie tin and bake for 25- 30 minutes, or until it starts to lose its shiny-ness. Leave it to cool for 10 minutes, and DONE! Easy isn’t it? i’m always down to try out new vegan brownie recipes, sounds delicious! 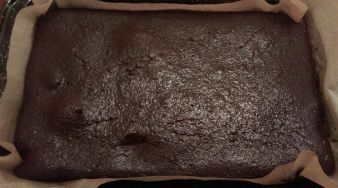 I was unsure about the vegan brownies at first, but they did turn out really nice!